The objective of eyeglass lenses is to correct refractive errors in vision. They do this by changing the direction of light, allowing images to come into focus on the retina. The amount of correction depends upon the index of refraction of the lens material and the difference in the curvature between the two surfaces of the lens. The greater both of these values are, the greater the correction. Samuel L. Jackson picked up 12 pairs the first time he saw Max Shustovskiy's collection. Observer. Tuesday, 09 Apr 2019 12:15:58 +0000. KETV. Thursday, 04 Apr 2019 21:42:00 GMT. There are several different types of eyeglass lenses. Unifocal lenses feature one correction for all distances, while multifocal lenses correct for more than one distance. A common multifocal lens is the bifocal lens, where the bottom area of the lens corrects for nearby objects, and the top part of the lens corrects for objects that are far away. The trifocal lens has an area in between the top and bottom part of the lens that corrects for intermediate distances. While bifocals and trifocals used to be evident by a telltale line dividing the lens, today's bifocals and trifocals are available without visible lines. Bifocal and trifocal eyeglass lenses without visible lines are called progressives or no-line lenses. Eyeglass lenses must be made out of a transparent material that is free of bubbles and has a high index of refraction. The greater the index of refraction, the thinner the lens. Today's lenses are made from glass or from hard resin plastic. Many people prefer plastic lenses because plastic is more difficult to break than glass and is also more lightweight. 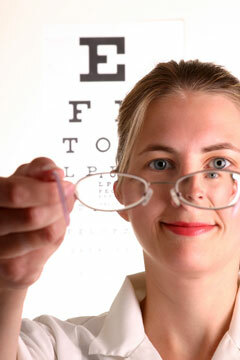 Glass, on the other hand, is less likely to scratch and allows for the best vision correction. 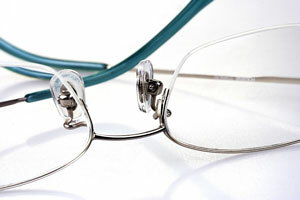 Glass was the sole material used in eyeglass lenses before plastic was introduced in the early 1940s. The first plastic lenses were made of acrylic, but they were prone to scratching, breaking, and discoloration. In addition, because acrylic had a low index of refraction, it couldn't be used for people who needed larger corrections. A plastic lens made out of CR-39, which was significantly more suitable, was introduced in the 1960s. Today, lenses are also available in polycarbonate and polyurethane. Polycarbonate lenses are the most impact resistant, while polyurethane has outstanding optical qualities, even better than glass. Lenses can be coated with certain materials, depending upon the wearer's needs. Those who are concerned with potential damage to the eyes as the result of sun can request coatings that block both ultraviolet (UV) and blue light. UV coatings are particularly desirable on sunglasses and ski goggles, which should indicate via labeling that they block out 99 to 100 percent of both UV-A and UV-B rays. Other types of coatings include anti-scratch coatings, which improve the surface hardness of the lens, and anti-glare coatings, which remove reflection and allow the eyes of the wearer to be seen through the lens. Anti-reflective (AR) coatings for computer use, mirror coatings, and a wide variety of tinted coatings are also available. Photosensitive lenses darken in sunlight, and are particularly convenient for those who don't want to carry additional glasses. Airwear - lightweight, polycarbonate lenses. Crizal - durable, scratch-resistant lenses. Varilux - progressive eyeglass lenses. Shamir - innovative progressive lenses. Signet Armorlite - ophthalmic lens manufacturer. Transitions - photochromic eyeglass lenses. Zeiss - innovative ophthalmic products. Rodenstock - lenses, frames, and sunglasses. Younger Optics - polarized lenses. 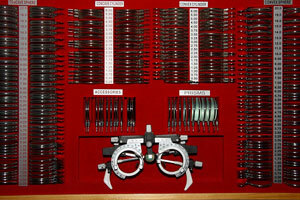 This eyeglass vendor directory lists eyeglass retailers throughout the USA.